What can we learn from the Government Outcomes Lab? Our Learning Advisor, Catherine Fisher, investigates a new research centre on outcomes-based commissioning and finds plenty of interest for the WASH Results Programme. You know an idea has traction when the University of Oxford sets up a research centre to investigate it. This is the case for outcomes-based commissioning (aka Payment by Results), which is the focus of the new Government Outcomes Lab (GO Lab) based at the University of Oxford’s Blavatnik School of Government. The GO Lab focusses on the interests and experience of government departments in procuring services in an outcomes-based way, rather than those of contractors (or suppliers, in WASH Results terminology) in providing them. It is a collaboration between Blavatnik School of Government and Her Majesty’s Government. The focus of the research centre is on outcomes-based commissioning that uses Social Impact Bonds (SIBs), a model in which external investors provide the initial investment for programme implementation which is repaid on achievement of outcomes. However, the GO Lab will also look at other models, presumably including that used in the WASH Results Programme in which the suppliers themselves provide the upfront investment. The rationale for the GO Lab is as follows: “While numbers of, and funding for, outcomes-based approaches have increased over recent years, research has not kept pace with this speed of growth. Much is still unknown about whether outcomes-based commissioning will meet its promise….Through rigorous academic research, the GO Lab will deepen the understanding of outcomes-based commissioning and provide independent support, data and evidence on what works, and what doesn’t.” (GO Lab FAQ) . So far, the GO Lab has organised three “Better Commissioning” events looking at outcomes-based commissioning in different sectors in a UK context, namely Children’s Services, Older People’s Services and promotion of Healthy Lives. A quick skim of the interesting post-event reports suggests that outcomes-based commissioning is seen as a way of promoting a greater focus on outcomes by providers (who may not already think in this way), of prompting innovation in service provision and of transferring the risk of new approaches from commissioners to socially-minded private enterprises. Similar themes occur in Results Based Aid discussions, although I’d suggest that the international development sector places a slightly greater emphasis on incentivising delivery, value for money and accountability to commissioners. One aspect of the GO Lab work that caught my eye is their interest in the creation of Outcomes Frameworks which were discussed at each event: “Developing an outcomes framework is a key part of any SIB or outcome based contract, but accessing data and articulating robust metrics that can be rigorously defined and measured is often seen as a challenge by commissioning authorities.” (Better Commissioning for Healthy Lives: a Summary Report, p 13). reflect the sustainability of outcomes beyond the term of the contract. streamlining metrics and indicators while balancing needs of all parties: beneficiaries, service providers, commissioners and, in the case of international development programmes, national stakeholders and global commitments such as Sustainable Development Goals. Lucrezia Tincani (Evaluation Team for WASH Results) shares a compilation of guides and best practice reviews on Payment By Results (PBR). This review for the Gates Foundation (2015) examines 30 PBR WASH programmes, predominantly implemented by the World Bank, all relatively small-scale. It outlines the minimum conditions that should be in place before choosing a PBR design. It suggests that PBR is better suited to private than to public providers, and works well in developing countries with low government capacity. However, it concludes that there is insufficient evidence to determine whether PBR WASH programmes are more efficient or more sustainable than non-PBR WASH programmes, also cautioning that there is limited evidence that PBR is effective at achieving behaviour change in community sanitation projects. Output-Based Aid is a form of PBR where aid is disbursed to governments who in turn contract a public service provider. These World Bank reports – (2010) and (2014) – outline the World Bank’s experiences of the Global Partnership on Output-Based Aid (GPOBA) with sanitation and water, respectively. The reports outline the preconditions necessary before choosing PBR approaches and outline case studies of the World Bank’s work. This paper by the Center for Global Development (2015) presents four major theories explaining the rationale for using PBR interventions and then explores which ones hold, through four case studies of Results-Based Aid in education and health, which were implemented alongside conventional aid programmes. It provides useful background on the different views regarding how and why PBR can act, and provides rich insights of how PBR has operated in the four case studies. The World Bank’s 330-page toolkit on performance-based financing (2014) contains a wealth of knowledge on design of PBR schemes, including selection of indicators and design of the verification process. Their GPOBA team also produced a useful overview note on approaches to independent verification of PBR programmes (2012). Though aimed at PBR schemes for health facilities, the lessons in the toolkit are generalisable across other sectors. The World Bank also produced a guide specifically for PBR in the energy sector (2013). This note (2014) by Clist & Dercon proposes 12 principles which should be considered when designing a PBR programme. It is relevant both for the implementers and evaluators of PBR programmes. It is a summary of their theoretical paper (2014) which outlines the likely costs and benefits of PBR programmes according to behavioural economics theory. This Cochrane Review of PBR programmes in health (2012) reviewed nine health PBR programmes and concluded that they were not uniform enough to be able to determine whether PBR programmes are more effective at improving health care than non-PBR ones. The review calls for more rigorous evaluations of PBR programmes, particularly to assess whether they are cost-effective. The German Development Institute (2013) also reviewed Results Based Financing experiences in the health sector. A DFID review (2013) synthesises 33 evaluations of PBR programmes: mostly health, with some education and one WASH programme (in Indonesia). It concludes that the added-value of PBR is, as of yet, unproven, highlighting that many evaluations have weak ‘external validity’, meaning that their conclusion are not generalisable to other contexts. This reinforces the premise that the success of PBR programmes is highly context specific. This report for NORAD (2008) came to a similar conclusion, as did this DFID review (2010) of Results Based Aid and Results Based Financing schemes, which also provides a useful overview of different types of PBR. A 2012 review by the European Network on Debt and Development (a network of 47 European NGOs) synthesises the experiences across six PBR multi-country initiatives (including GPOBA) and analyses how the amount of PBR financing has increased over time. MANGO (a UK NGO network) produced a report (2015) specifically highlighting the contractual risks of PBR contracts. This much-cited blog by Robert Chambers (2014) also highlights some of the risks of implementing PBR programmes. A SIDA review (2015) outlines the factors to be considered when designing a PBR programme, and outlines SIDA’s experience with different types of PBR so far (albeit limited). Similarly, this DFID ‘Smart Guide’ (2014) gives a brief overview of the factors to be considered when designing a PBR programme, and provides a list of all DFID PBR programmes operating at that time. DFID’s PBR evaluation framework (2015) provides useful guidance for those designing an evaluation of a PBR programme, including a detailed set of possible evaluation questions. 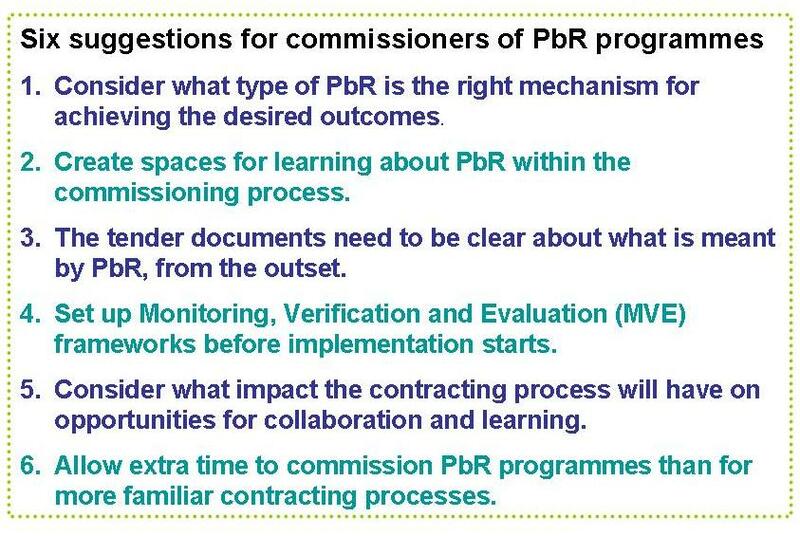 These are also important for implementers when considering whether or not to implement a PBR programme. A review by the UK National Audit Office (2015) cautions that PBR schemes are “hard to get right, and are risky and costly for commissioners”. Thus, most UK PBR programmes only link 20% of payments to performance. The review covers work done by the whole of the British Government, not just by DFID. The websites of the Suppliers implementing the WASH Results Programme (SWIFT, SNV and SAWRP) also provide useful insight into the reality of implementing a PBR programme. Given the absence of clear evidence about what works under different contexts, this reading list can never truly be complete or offer simple answers to questions about how best to implement PBR programmes. A key challenge is isolating the success or failure of the PBR modality itself from the success or failure of the technical intervention, which can be affected by external factors unrelated to PBR. Thus, there is still little evidence of the added benefits of PBR, because an accurate counterfactual cannot easily be established (rarely is a non-PBR programme with almost identical activities implemented alongside the PBR programme). Lucrezia Tincani (OPM) leads the evaluation of the WASH Results Programme. In this post we compare the Output-Based Aid (OBA) experience of independent verification with that of the WASH Results Programme. Earlier this year the Global Partnership on Output-Based Aid (GPOBA) produced a short paper called ‘Getting Results: Independent Verification in Output-Based Aid‘. Although the paper focusses on Output-Based Aid, while our work as independent verification agents on the WASH Results Programme also encompasses verification of outcomes, many of the findings were relevant to our work. We agree about the fundamental importance of getting the right indicators, that they match the intended purpose of the programme and are clear and unambiguous. And we too recognise the tricky balance between optimum frequency of verification rounds and the need for suppliers to have regular cash-flow. One of our previous blog posts shares some of our learning in this area. The most thought-provoking aspect of the paper was the case studies describing innovative approaches to verification. The first case study explores the World Bank’s Local Government and Decentralization Project in Indonesia— a pilot approach in which government auditors have been supported to take on the independent verification role. Capacity building and financial support are provided through a grant, presumably outside the OBA funding mechanism. This need for strengthening government capacity in monitoring results is something we touch on in a previous post about alignment under Payment by Results in which we mention DFID’s work in this area in Tanzania. It’s good to see more examples of it happening. Collecting reliable and meaningful data requires a strong understanding of the realities and dynamics of the field. Data collection requires relationships with local implementers who are key to providing information needed for verification. This requires a lot of goodwill and coordination, which would be unlikely if an independent third party monitor was used. Keeping data collection in-house avoids the huge risk inherent in de-linking the supplier (responsible for achieving the results, and getting paid for them) from the monitoring of the results. On the other hand, the WASH Results Monitoring and Verification (MV) team has sometimes raised concerns about whether baseline surveys conducted by suppliers are rigorous enough for verification purposes. One way forward seems to be for MV teams to approve the design of baseline surveys before they are carried out and ideally for this to be hard-wired into programme design. For more about this discussion, see the report from the learning event. The final box in the GPOBA note talks about technological innovation in verification. It shares some interesting examples such as low cost sensors and combining use of images and GPS. We too have found that the demands of verification have prompted technological innovation in monitoring, in particular using mobile-based technology. However, because the WASH Results Programme relies primarily on supplier-generated data, most of the innovation in this area has been undertaken by the suppliers. Again, what is striking about the innovation in monitoring described in the paper is that it appears to have been funded outside the OBA funding mechanism e.g. through an Innovation Grant. Presumably, these methods were tested before being implemented in an OBA context. This resonates with a comment made during a debate within WASH Results about creative ways of monitoring outcomes “Do we want to be creative, or do we want to get paid?”. At its heart, verification is about finding the most efficient way of providing confidence to donors that suppliers have done what they have said in order that they can be paid. Creativity is good, but in a 100% PBR context in which suppliers pre-finance all their activities, getting paid is better. Finally, it is worth noting that the paper does not reflect on the impacts (intended or otherwise) and value of independent verification of OBA, that we have been exploring. It would be a much longer paper if it did! The three suppliers in the DFID WASH Results programme (SAWRP consortium, SWIFTconsortium and SNV) came together at a side event held during the WEDC Conferencein Kumasi, Ghana (11-15 July 2016) to present their thoughts on “measuring WASH sustainability in a Payment by Results (PBR) context”. Our series of reflections on the WASH Results Programme’s learning starts by identifying where Payment by Results has added value. Payment by Results (PBR) has been “a highly effective means of incentivising delivery at scale” according to the people that deliver the WASH Results Programme. This finding taken from the report of a recent WASH Results learning event may surprise some PBR naysayers. However, as this first post in a series of reflections on the report shows, when the donors, suppliers and verifiers of WASH Results came together to reflect on their experience of actually delivering and verifying the programme, they were able to agree on several positives alongside their concerns. The pros and cons of PBR in development are hotly debated online, but the Center for Global Development reminds us that when discussing PBR, we should be clear about who is being paid, for what and how. The particular way in which WASH Results was designed has therefore influenced the experiences of its suppliers (SNV, and the SAWRP and SWIFT consortia). An important feature of the design (extrinsic to the PBR modality) is that delivery was tied to the water and sanitation target (Target 7.C.) of the Millennium Development Goals. The programme began with an extremely time-pressured initial ‘output phase’ to December 2015 (focussing on installation of WASH infrastructure), followed by an ‘outcomes phase’ that started this year. Another key design feature is that WASH Results is 100% PBR. The nature of the results, however, were agreed on a case-by-case basis with each supplier and include outputs, outcomes and in some cases, process-type activities. “Grants have never made it so clear that you ought to deliver. Country directors have to deliver in ways that they have not necessarily had to deliver before and this transpires through to partners, local governments and sub-contractors…Quite a number of these actors have started to applaud us for it.” (Jan Ubels, SNV). Different consortia passed on the risk of PBR to partners in different ways and the SNV experience reflects their particular approach. But it is evident that the clarity of expectations and pressure to deliver across consortia has been effective in generating results. So, apart from the focus on delivery, what else did people value about the way that PBR has been implemented in the WASH Results Programme? In particular, participants valued the flexibility shown by DFID in setting targets and results milestones to reflect different programme approaches – including agreeing payments for process achievements in some cases. Flexibility in definitions also allowed alignment with local government definitions. The drawback of this flexibility was lack of clarity about expectations and lack of standardisation across different suppliers. Suppliers have been able to reallocate resources in response to changing contexts and priorities, without negotiating with the donor. It has also been possible to spread risk across multiple sites of operation; overachieving in one location to offset lower results in another. The focus on results has driven investment and improvements in Monitoring and Evaluation which is broadly thought to have value beyond the programme. Although reporting requirements that are focused exclusively on results are demanding, people welcomed not having to do the activity reporting that is a feature of many other forms of aid. Some positives were identified during the discussions at the WASH Results workshop and there is much to celebrate. However, a central theme in the workshop was the ongoing challenge of how to place value (in commercial/financial and value for money terms) on intangible aspirations and benefits, such as reaching the most vulnerable and investing in the processes and social capital that underpin effective programming. These challenges will be explored in the next post. The report from the workshop is available to download from DFID’s Research for Development website. Is it time for Results 2.0? Catherine Fisher reports back on a Bond Conference panel discussion about the origins and future of the ‘results agenda’. Aid should generate results. On the face of it, an indisputably good idea, but the ‘results agenda’ is anything but uncontroversial and can spark “epic” debates. In the WASH Results Programme, this agenda is manifest in the funding relationship – Results Based Financing (RBF) – a form of Payment By Results (PBR) through which DFID makes payments to Suppliers contingent on the independent verification of results. As the Monitoring, Verification and Evaluation (MVE) providers for WASH Results, we’re keen to exchange the programme’s insights with those of other people who have first-hand experience of the results agenda. One such opportunity arose this week at the Bond Conference, in a session entitled ‘How to crack Results 2.0’ chaired by Michael O’Donnell, Head of Effectiveness and Learning at Bond and author of ‘Payment by Results: What it means for UK NGOs’. The session considered the origins and implications of the results agenda and looked ahead to the next version. Catherine Fisher, Learning Advisor for the WASH Results MVE team, reports on a lively discussion about how results agendas could be aligned with work on social transformation, enable learning and reflection within programmes, and provide value for money themselves. Opening the session, Kevin Quinlan, Head of Finance, Performance and Impact at DFID explained how, in 2010, DFID encountered two opposing forces: increased funding in order to meet the UK’s legal commitment to spending 0.7 percent of national income on Overseas Development Aid alongside the introduction of austerity measures that required cuts in, and increased scrutiny on, public spending. Results and transparency agendas were DFID’s response to those competing demands and made a shift towards delivering results now in comparison with systems strengthening for results in future. This implied a corresponding shift to talking about the results DFID is going to support rather than the activities they would support to achieve results in future. Six years on, DFID is reassessing its approach. Can results approaches be reconciled with the “art of transformation”? Earlier that day, Dr Danny Sriskandarajah, Secretary General of CIVICUS, told conference delegates that INGOs had become too focused on the “science of delivery” (which he described as the achievement of impact by any means) as opposed to the “art of transformation” – the work of bringing about social change. This theme re-emerged during the ‘Results 2.0’ discussion: how could the focus on hard results, embedded in results frameworks, be reconciled with the messy business of social transformation that is at the heart of struggles for equity and rights? Jessica Horn, Director of Programmes at the African Women’s Development Fund, noted that results frameworks do not acknowledge power or monitor how it is transformed. Consequently she and her colleagues resort to what she called “feminist martial arts” – twisting and turning, blocking and jabbing to defend the transformative work they do, from the “tyranny of results”. Often, Jessica argued, the politics of the process are as important as the politics of the outcome and asked “how does the results framework capture that?” Yet as Irene Guijt, newly appointed Head of Research at Oxfam GB, argued, being forced to think about results even in the social transformation context helps to make things clearer. Between them, they had some suggestions about how it could be done. Irene contended that there needed to be greater differentiation of what kind of data we need for different reasons, rather than a one-size-fits-all approach to accountability. She argued that “results” are too often about numbers and we need to bring humans back in and tell the story of change. Irene recommended using the tool SenseMaker to bring together multiple qualitative stories which, through their scale, become quantifiable. Jessica shared some frameworks for approaching monitoring and reporting on social transformation more systematically and in ways that consider power, such as Making the Case: the five social change shifts and the Gender at WorkFramework. Does focusing on monitoring results for accountability squeeze out reflection and learning? This criticism is often levelled at results-based approaches and their associated heavy reporting requirements. Irene commented that “learning and data are mates but compete for space”. To align learning and reflection with results monitoring, she advised focusing on collective sense-making of reporting data, a process that enables evidence-based reflection and learning. She also suggested streamlining indicators focussing on those with most potential for learning, a point echoed by Kevin from DFID who emphasised the need to select indicators that are most meaningful to the people implementing programmes (rather than donors). Do results agendas themselves demonstrate value for money? This question resonated with the participants, triggering musings on the value of randomised controlled trials and the cost of management agents from the private sector. One point emerging from this discussion was that often what is asked for in results monitoring is difficult to achieve. Indeed, this has at times, been the experience of the WASH Results Programme, particularly in fragile contexts (see for example, the SWIFT Consortium’s report [PDF]) . Both Irene and Jessica talked of the need to use a range of different tools for different purposes and Irene made reference to her recent work on balancing feasibility, inclusiveness and rigour in impact assessments. What is the trajectory for DFID and the results agenda? Alleviating the torture of results – “rightsizing” the reporting burden and reducing the transaction costs of results reporting; thinking about what results can do alongside other tools. Adopting a principles-based approach rather than a set of rules. Meanwhile the Evaluation Team for WASH Results is investigating some of the issues raised during the panel such as examining the effect of results verification on Suppliers’ learning and reflection, and seeking to explore the value for money of verification. So it sounds like there will be more interesting discussions about the results agenda in the near future and we look forward to contributing insights from WASH Results*. Whether Results 2.0 is on the horizon remains to be seen. * Please email the MVE Team if you would like us to let you know when our evaluation findings are available. Our last post shared our lessons on Payment By Results (PBR); this time we’re taking a look at what other people are saying about it. A new literature review [PDF] intends to help PBR stakeholders: clarify the purpose of an individual PBR scheme, identify critical success factors, identify common issues which cause problems and difficulties, and be aware of how they might address or mitigate them. The review’s author, Russell Webster, is currently exploring the main themes of the review through a series of blog posts – the most recent ones question if PBR can improve outcomes and if PBR can save money. What have we learned about Payment by Results (PBR) programmes from verifying one? After 19 verification rounds, the WASH Results Monitoring and Verification team shares its suggestions for how to design future PBR programmes. Verification is at the heart of the WASH Results Programme. Suppliers only get paid if we, the Monitoring and Verification (MV) team, can independently verify the results they are reporting. Usually we can: results are reported by Suppliers, verified by us and Suppliers are paid by DFID to an agreed schedule. However, all Suppliers have received deductions at least once, which, although painful for everyone, is testament to the rigour of the verification process. Overall, the system is working and the results of the programme are clear. But the demands of verification are also undeniable, leading to some aspects of verification being labelled “Payment by Paperwork” and like any process, it could be improved. In January 2016 the team* came together to reflect on what we have learned so far from conducting 19 rounds of verification across the three Suppliers. Our discussions focused on verification but inevitably considered wider issues around design of a PBR programme. Here we share some suggestions for design of future PBR programmes, from a verification perspective. The WASH Results Programme has ambitions with regard to equity, gender and disability and overall health benefits that are not universally built into targets and payment milestones agreed between DFID and Suppliers. As a consequence, these ambitions are not explicitly incentivised. Any future programme should think carefully about how the design of the programme, especially the targets set in the tender and agreed with Suppliers, uphold objectives based on good practice within the sector. We have found that when payment decisions are riding on whether targets have been met, the devil is in the detail. During implementation, some discrepancies have emerged over targets and how to achieve them. Discussions have taken place about minimum standards for latrines (DFID or JMP definition) and hygiene targets (what does ‘reach’ mean?). In addition, there was occasionally lack of clarity on how achievement of targets would be measured. When working at scale, assumptions made about the average size of a household in a particular area, or the best way of measuring the number of pupils in a school become subject to intense scrutiny. This is quite a departure from how programmes with different funding mechanisms have worked in the past and the level of detailed evidence required may come as a shock for Suppliers and Donors alike. In response, we suggest that future programmes should provide clear guidance on technical specifications relating to targets and guidelines for evidencing achievements. One concern that we discussed in the meeting was that the design of the WASH Results Programme does not sufficiently incentivise alignment with local government. We suspect that this was a result of the scale of the programme and the tight timelines, but also the demands of verification. The need to generate verifiable results can dis-incentivise both the pursuit of “soft” outcomes such as collaboration, and, working with government monitoring systems. We suggest that PBR programmes need to think carefully about how to incentivise devolution of support services from progamme teams to local governments, and to other sector stakeholders during the life of the programme, for example by linking payments to these activities. Also, to think how programme design could encourage long-term strengthening of government monitoring systems. The merits or otherwise of the 100% PBR mechanism in the WASH Results Programme are subject to much discussion; we considered them from a verification perspective. We believe that, in response to the 100% PBR mechanism, some Suppliers included input- and process-related milestone targets to meet their internal cash flow requirements. In some cases, this led to verification processes that required high levels of effort (i.e. paperwork) with relatively few benefits. We suggest that people designing future PBR programmes consider non-PBR upfront payments to Suppliers to avoid the need to set early input and process milestones, and run a substantial inception phase that includes paid-for outputs for Suppliers and Verifiers. In the implementation phase of the WASH Results Programme, payment milestones have been mainly quarterly, so requiring seemingly endless rounds of verification that put pressure on all involved, particularly Supplier programme staff. In response, we suggest that payments over the course of a programme should be less frequent (and so possibly larger), so requiring fewer verification rounds and allowing greater space between them. This may have implications for the design of the PBR mechanism. The WASH Results Programme does not include payment for over-achievement. Over the course of the programme, some Suppliers have argued that over-achievement should be rewarded, just as under-achievement is penalised. As Verifiers, we agree that paying for over-achievement for outcomes would be a positive change in a future PBR design. However, there were concerns among our team that encouraging over-achievement of outputs could have unintended consequences such as inefficient investments or short-term efforts to achieve outputs without sufficient attention to sustainability and the quality of service delivery. Key inception outputs should include a monitoring and results reporting framework agreed between the Supplier and the Verification Agent. Suppliers and Verifiers could be paid against these outputs to overcome cash flow issues. The inception phase should include Verification Team visits to country programmes to establish an effective dialogue between the Verifiers and Suppliers early on. If Suppliers evidence their achievements (as opposed to independent collection of evidence by the Verification Agent – see below), assessment of, and agreement on, what are adequate results reporting systems and processes need to be included in the inception phase. Run a ‘dry’ verification round at the beginning of the verification phase where payments are guaranteed to Suppliers irrespective of target achievement so that early verification issues can be sorted out without escalating stress levels. In the WASH Results Programme, Suppliers provide evidence against target achievements, which is subsequently verified by the Verification Team (we will be producing a paper soon that outlines how this process works in more detail). Is this reliance on Supplier-generated evidence the best way forward? What are the pros and cons of this approach as compared with independent (verification-led) evidence generation? Indications are that the PBR mechanism has improved Suppliers’ internal monitoring systems, and has shifted the internal programming focus from the finance to the monitoring and evaluation department. However, relying on Suppliers’ internal reporting systems has required some Suppliers to introduce substantial changes to existing reporting systems and the MV team has faced challenges in ensuring standards of evidence, particularly in relation to surveys. We have some ideas about pros and cons of Supplier-generated evidence as opposed to evidence generated independently, but feel this can only be fully assessed in conversation with the Suppliers. We plan to have this conversation at a WASH Results Programme Supplier learning event in March. So, this is not so much a suggestion as a request to watch this space! WASH Results Programme Learning Event: On March 7 2016 Suppliers, the e-Pact Monitoring & Verification and Evaluation teams, and DFID will convene to compare and reflect on learning so far. Key discussions at the event will be shared through this blog. Verification framework paper: an overview of how the verification process works in the WASH Results Programme. This will present a behind-the-scenes look at verification in practice and provide background for future lessons and reflections that we intend to share through our blog and other outputs. 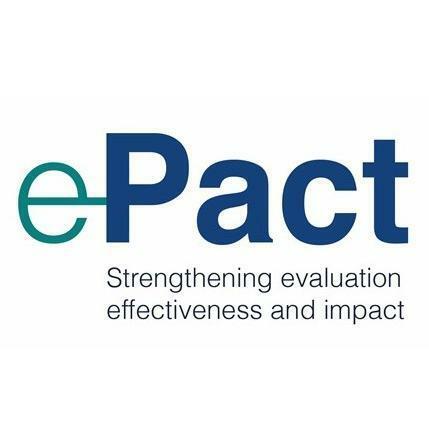 * About the MV Team: In the WASH Results Programme, the monitoring, verification and evaluation functions are combined into one contract with e-Pact. In practice, the ongoing monitoring and verification of Suppliers’ results is conducted by one team (the MV team) and the evaluation of the programme by another. The lessons here are based on the experience of the MV team although members of the Evaluation team were also present at the workshop. Read more about the WASH Results Programme. January 1st, 2016 is an important date for the DFID WASH Results Programme.The Sustainable Development Goals (SDGs) take the place of the Millennium Development Goals (MDGs) and ‘WASH Results’ moves into the second half of its funding period. At this stage the focus for the programme’s Suppliers (SAWRP, SNVand SWIFT) will start shifting from getting things done, to keeping things going and ensuring the sustainability of WASH outcomes. For e-Pact too, as the independent verifiers, it’s farewell to Outputs and hello to Outcomes. Once the goals to provide access have been reached, attention turns to sustainability. Reflections by DFID WASH Results’ suppliers on the programme’s design and commissioning, summarised into six suggestions for commissioners. Payment by Results (PbR) is a technically challenging form of contracting and one that is new for DFID and many of its partners (NAO 2015, p8, DFID, 2015 p18). The WASH Results Programme was designed using the PbR financing mechanism, and therefore has great potential for learning about the impact of PbR on programming. One year into the programme, the WASH Results suppliers met to share experiences so far, particularly how the programme was designed and commissioned and the effects PbR had. This discussion has been distilled into a set of suggestions for people commissioning PbR programmes in development. The discussions reflected the participants’ experiences as people leading supplier consortia, rather than those directly implementing the programme or its beneficiaries and although DFID staff were present their role was largely that of observer. Discussions built on the early findings shared by the Oxford Policy Management team leading the formal evaluation of the programme for the e-Pact consortium. The suggestions that emerged are inevitably not as rigorous as the final findings that will come from this formal evaluation nor from others’ extensive reviews drawing on multiple programmes and experience. However, our suggestions add support to some of the National Audit Office (NAO) recommendations on PbR that were published a month after our workshop, in particular the “Payment by Results: analytical framework for decision-makers” (NAO, 2015). 1. Consider what type of PbR is the right mechanism for achieving the desired outcomes. There are multiple ways in which PbR programmes can be designed and the selection made will influence who applies, how suppliers devise and manage their programmes and the subsequent results. An important difference between PbR programmes is the proportion of payment that is “pure PbR”. WASH Results is designed as a 100% PbR programme and this prompted some suppliers to take steps to minimise the risk of not achieving targets. Some set disbursement milestones early in the impact pathway to aid cashflow, rather than set exclusively outcome-based milestones. Some rethought the areas they were working in, shifting away from work in the most challenging areas, and there is some indication that suppliers relied on tried and trusted methods rather than trying new approaches. The workshop participants suggested that pre-financing may be necessary to achieve genuine emphasis on outcomes, particularly in risky contexts or if innovation is important so that risks are not born solely by suppliers. Echoing other discussions on PbR (BOND p13) , participants discussed how the PbR mechanism may not be appropriate for programmes that are intended to target the most vulnerable and/or operate in fragile contexts, however, the success of the WASH Results Programme in the Democratic Republic of Congo demonstrates that it should not be ruled out. These issues need careful consideration when selecting the design of a PbR programme and the NAO report provides an analytical framework for doing so. 2. Create spaces for learning about PbR within the commissioning process. As the PbR modality is new to many organisations (suppliers and commissioners) it is important for commissioners and suppliers to explore options and learn from experience in order to design the most effective model. Ideally this will happen in an interactive way that will help to build relationships between stakeholders. Workshop participants stressed the importance of learning from the private sector about approaches to PbR, for example in areas such as how to assess and price risk. They also advocated a longer inception phase in programmes using multiple suppliers, to enable suppliers to talk to each other about the approaches they are considering adopting. The NAO’s analytical framework for decision-makers advocates a learning approach to commissioning PbR programmes and it encourages commissioners to engage in dialogue with potential providers from the outset. However it does not explicitly recommend creating spaces for learning and relationship-building between stakeholders within the commissioning process; we think this would be a useful addition to the framework. 3. The tender documents need to be clear about what is meant by PbR, from the outset. This includes providing the rationale for using PbR and sufficient detail about matters such as disbursement, results, and the processes and conditions around force majeure, particularly but not exclusively in fragile contexts. There should be clear guidance on how to define minimum standards: in sanitation, for example, does the minimum criteria for improved latrines allow for shared use? The NAO framework helps commissioners to think through high-level issues, however the detail of sector specific standards may need to be determined in pre-tendering discussions with potential suppliers and/or monitoring and verification providers. 4. Set up Monitoring, Verification and Evaluation (MVE) frameworks before implementation starts. The MVE team for a PbR programme needs to be appointed before the suppliers and the MVE framework needs to be created before implementation starts. This would enable standardisation of approaches across suppliers and enable suppliers to create their monitoring and evaluation frameworks according to the requirements of verification processes. This is perhaps the clearest suggestion to emerge from the workshop and once again accords with the NAO framework which asks “Is there an agreed system for measuring provider performance? Will this system be in place at the start of the scheme?” The WRP suppliers’ experience suggests that it should be! 5. Consider what impact the contracting process will have on opportunities for collaboration and learning. The workshop participants felt that the tendering process for the WASH Results Programme made international non-governmental organisations into competitors rather than collaborators and this can lead to lack of transparency and learning between organisations. Given the broader move within aid commissioning from grants towards more competitively tendered contracts, this is an example of where it is difficult to attribute effects purely to the PbR mechanism. As an alternative to a competitive tender, the WASH Results suppliers suggested commissioners pursue a “negotiated” procurement procedure during which the commissioner enters into contract negotiations with one or more suppliers. 6. Allow extra time to commission PbR programmes than for more familiar contracting processes. Pre-bidding phase: in which the donor’s understanding of PbR is clearly laid out, and in which potential suppliers are able to access insights into the different models of PbR financing and the requirements and risks of implementing a PbR programme. Bidding/contracting phase: recognising that this is a resource-intensive process for suppliers; possibly conducted as a negotiated process rather than a competitive tender. Inception phase: with space for suppliers to share approaches and refine their programme design, in which a standardised MVE framework is shared and refined and means of verification agreed; milestones and payment schedules are agreed; programme expectations are agreed with partners; and consortia develop common understanding, language and approaches. Implementation phase: implementation with appropriate verification cycles and disbursement points, ongoing learning and review. Closing phase: for end-of-term evaluation, especially to draw out lessons learnt and find ways of furthering work beyond the project period of implementation. Have you tendered for, or commissioned a PbR programme? Do our suggestions and observations reflect your experience? What suggestions would you add to our list? The e-Pact Consortium is finding out through Verifying and Evaluating DFID’s WASH Results Programme. But we’re not waiting until 2018, when the programme ends, to pass on what we’ve discovered to other suppliers, donors and verifiers about how this relatively new funding mechanism works in the WASH sector. Throughout the programme we’ll be writing about our experience of being Independent Verifiers, sharing emerging findings from our Evaluation team, highlighting lessons learned by the Suppliers, and taking a look at what other people are saying about Payment by Results. Can Payment by Results raise the bar for downward accountability? This blog is an output from a programme that has been funded by UK aid from the UK government; however the views expressed do not necessarily reflect the UK government’s official policies or those of the programme’s partners. Payment by Results (PBR) could encourage downward accountability if verification included beneficiary feedback that was linked to payment. One of the criticisms levelled at PBR is that it promotes upward accountability to donors rather than downward accountability to beneficiaries. Members of the Monitoring and Verification (MV) team for the WASH Results Programme recently discussed whether this reflects their experience and what role there is for beneficiary feedback in verification processes and in this post we summarise those discussions. The MV team agreed that upward accountability is not necessarily any worse in PBR programmes than in other funding modalities. In fact, the feeling was that the scale of verification is likely to provide a more accurate picture of what is happening across programmes than the not necessarily representative glossy human interest pieces that often emerge from grant funded programmes. Indeed, if verification was designed to include beneficiary feedback and this was linked to payment, PBR could actually generate more downward accountability than other funding modalities. However it is this link between beneficiary feedback and payment that is challenging. Data needs to be unambiguously verifiable which limits the kinds of areas that can be explored. If payment is only made against very specific (technology-focused) outcomes, then there is a fair chance that some, if not all, of the qualitative and governance issues will be missed or under-emphasized. But it is difficult to come up with effective “soft” indicators that can be linked to payments, as these tend to be more subjective, with less certain targets, that are more easily affected by the facilitation/enumeration of the survey/measuring process, and more variable by context. So far, in the WASH Results Programme, this has generally limited beneficiary feedback within verification to confirming that something happened when the supplier reported it (e.g. that a toilet was built in September 2014), not whether the beneficiary liked the toilet or even wanted it. There is scope for using approaches such as satisfaction surveys or including questions about beneficiary satisfaction in household surveys, where results are triangulated with other methods. In addition, a lot of work is currently being undertaken on scorecard and feedback approaches in a wide range of sectors, including the WASH sector. The use of any of these approaches in a PBR context would require both donor and supplier to be very clear on what is being paid for (e.g. infrastructure development, service provision or behaviour change) and what the triggers are for payment or non-payment. Including more qualitative approaches in verification, such as focus group discussions or individuals’ stories is also achievable. The challenge is ensuring they are representative of the programme as a whole, requiring them to be randomly sampled. This, of course, requires more resources. The question of resourcing is key – it is possible to verify almost anything with unlimited resources, but in the real world, different priorities need to be weighed up against each other. In practice, the demands of verification for large scale, representative, quantitative information on which to base payment decisions may leave less time, money and inclination to undertake more qualitative work with beneficiaries. A resource effective approach to upholding downwards accountability through verification would be to include payment for the existence and effective functioning of a beneficiary feedback system (rather than the results of that system). Payment would be made on verification of the effectiveness of the system in promoting downwards accountability. This would only work in a systems-based approach to verification such as that used in the WASH Results Programme where verification is based on data generated by suppliers with the MV team assessing the strength of the systems that generate that data through ‘systems appraisals’. In this scenario, assessment of any beneficiary feedback system would be an extension of the systems appraisal currently undertaken by the MV team; payments could be linked to the results of that appraisal, which is not currently the case. Finally, it is worth highlighting that the results based reporting requirements, on which the PBR system relies, generate reports that are different from the more qualitative and narrative reports associated with other forms of aid modalities, such as grants. If donors require human interest stories to communicate a programme’s results to the public, they will need to include this requirement within suppliers’ contracts and Terms of Reference. In conclusion, our experience suggest that the PBR approach does not inherently promote upward accountability at the expense of downward accountability; it depends on how the contract is designed. We believe that including a requirement for beneficiary feedback as part of verification of results could help to promote downward accountability. We encourage donors to consider this when designing and negotiating PBR programmes. * This blog post is based on a summary by Catherine Fisher of an online discussion held in June 2016 among members of the Monitoring and Verification team for the WASH Results Programme (Andy Robinson, Joe Gomme, Rachel Norman, Alison Barrett, Amy Weaving, Jennifer Williams and Don Brown). To what extent does the Payment by Results approach of the WASH Results Programme follow the aid effectiveness principle of alignment? One argument for Payment by Results (PBR) is that it can promote “alignment”, which is also an important principle in aid effectiveness. So that’s good, right? But, a closer look at how this slippery term is used reveals differences in understanding that are particularly relevant to the use of PBR in International Development. According to some PBR commentators, PBR can bring advantages in situations where there is misalignment between the objectives of donors and implementers, but there is some debate about this argument, (see, for example, CGD’s commentary on principle 5 of Clist & Dercon’s 12 principles of PBR). Either way, the alignment in question here is between the objectives of donor and implementer (or Suppliers as we call them in WASH Results; in our case either individual – SNV, or consortia of, non-governmental organisations – SAWRP and SWIFT). Compare this with the understanding in the Paris Declaration in which alignment is one of the five principles of Aid Effectiveness. The first principle of Ownership states: “Developing countries set their own strategies for poverty reduction, improve their institutions and tackle corruption.”. The second principle, Alignment, builds on this: “Donor countries align behind these objectives and use local systems.”. In this case, the alignment is that of donors behind national strategies and objectives. The PBR funding mechanism for the WASH Results Programme is the type that DFID calls Results Based Finance. Under this approach, the contract is between a donor and a service provider, not recipient governments (DFID calls the latter Results Based Aid*). In this context, the term “alignment” as used in the PBR literature may be at odds with the concept of alignment in the Paris Declaration for Aid Effectiveness as it encourages alignment between service provider and donor rather than donor with national stakeholders and priorities. This has led some people to claim that PBR promotes upwards accountability to donors at the expense of accountability to national and local stakeholders. Alignment is happening, whether incentivised by PBR or not: All of the Suppliers work with local stakeholders as a matter of course. However differences in programme design affected to what extent this was incentivised or recognised in payment packages. All of the Suppliers had experienced positive reactions from local stakeholders to the principle of PBR – with one Supplier being asked by local government officials for support in rolling out PBR in one of their programmes. Value of building alignment into results packages: There was some sense that the focus on outputs in the first phase of WASH Results had taken attention away from areas such as alignment that are not so easily linked to milestones and so opportunities for alignment had been missed. However, SNV took a different approach to other suppliers by building concrete items into their results packages to reflect their work with local partners, e.g. district plans in each of 60 districts in which they work. While this was felt to be a “smart” approach – SNV warned that there are also disadvantages: “We think we have found some meaningful ways to address elements of alignment, but let’s not be too optimistic about these instruments; they focus attention on direct deliverables” (Jan Ubels, SNV). Challenge of timelines: WASH Results has tight deadlines and an emphasis on deliverables while partners, e.g. water authorities, are working to a different longer timeline and may not deliver at the pace required. There is a limit to how much risk can be transferred to partners in this context. PBR risks limiting Suppliers to existing relationships: participants agreed that PBR can only be introduced where there is existing relationships and social capital and it would be risky to try to implement PBR in places where there was no established relationship. Additional demands of monitoring for PBR: One Supplier felt that the kind of monitoring carried out for WASH Results could never be the same as that carried out at a local level; it would always be additional to, rather than aligned with, that of the government, although it might stimulate M&E at a local level. Valuing alignment at tendering and contracting stage: Alignment should be considered when costing at the tendering and contracting stage so that prospective Suppliers are competing on an equal basis, given the additional cost (and value) alignment brings. Defining specific hard deliverables, perhaps during a pre-inception phase, that were somewhere between output and outcome phase e.g. district plans. For PBR to be accepted as an effective form of aid financing it will need to follow all the principles of aid effectiveness, including alignment. The experience of WASH Results so far suggests that this is possible but requires careful consideration of how alignment can be promoted during the design of programmes, contracting and tendering processes, definition of results and design of verification systems. Another, more macro, way of supporting alignment using PBR, is for the Independent Verifiers to work much more closely with the national government monitoring systems to verify results. In this model, significant support is given by the donor to improve the national systems and then recipient countries themselves can do the verification. In this case, the use of PBR to fund service delivery would act as a catalyst for strengthening monitoring systems at a national level (although the PBR programmes would need to be of significant scale to be an effective catalyst). This sector-strengthening approach requires long-term investment and a multi-pronged approach, within which PBR projects may only be one element, albeit a potentially catalytic one. We have not seen much focus on this area so far in the debates around PBR (please alert us to it if we are wrong!). We hope that the experience of our programme will help contribute to that understanding. We will continue to share ongoing lessons learned from implementation as well as findings from the evaluation. * For an example of a Payment By Results programme in WASH that uses Results Based Aid (where payment goes from the donor to a recipient government), we suggest readers take a look at DFID’s Support to Rural Water Supply, Sanitation & Hygiene in Tanzania. Participants of the WASH Results 2016 Learning Workshop exploring areas of agreement.